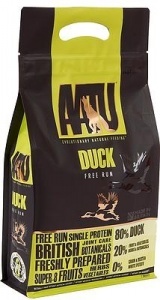 AATU dog food is one of the finest quality diets on sale anywhere. It has a single source protein formula of 80/20 (80%meat, 20% fruits and vegetables). Made with fully traceable British meats. Made in Britain using top quality ingredients. AATU is grain free and contains no potato or gluten. Handcrafted in small batches it is made with no artificial flavours, colours or preservatives. For every 1Kg of finished product AATU use 2.5Kg of raw natural ingrdients. Contains Glucosamine Chondroitin and MSM for healthy joints plus prebiotics to aid digestion.